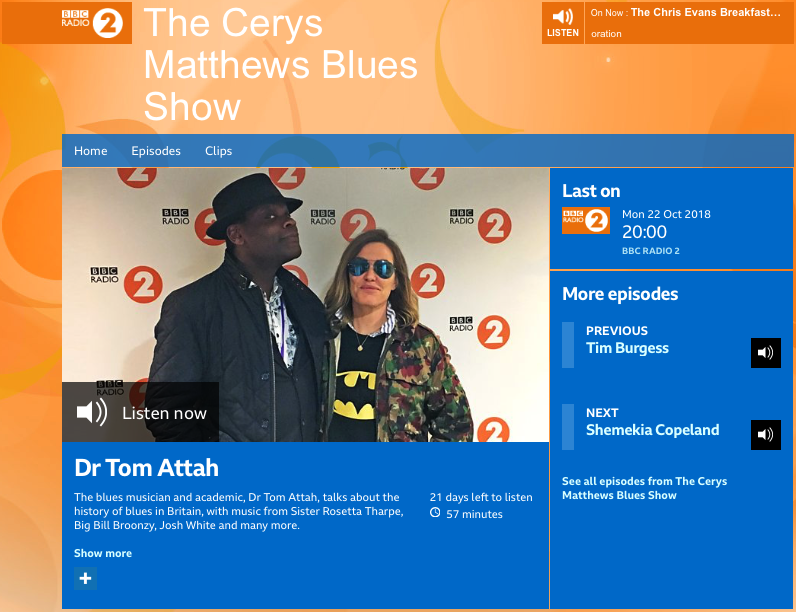 Cerys Matthews MBE is the host of the Radio 2 Blues Show and it was a complete delight to talk with her on air about the beginnings of the blues in Britain. She is incredibly knowledgeable about many styles of music and we had a great conversation about Josh White, Sister Rosetta Tharpe, Big Bill Broonzy, and Errol Linton. I’ve always loved Cerys’ work and it was great to finally meet and work with her in a small way. Nothing beats being called “Dr Tom” in that astonishing Welsh accent…! Line 6 G70 – TC Electronics Spark Mini – Strymon Mobius – TC Electronics Flashback Mini – TC Electronics Hall of Fame Mini – Amplifier. There’s a lot of processing power and the flexibility of the wireless system. An interview for Colne Blues 2017! 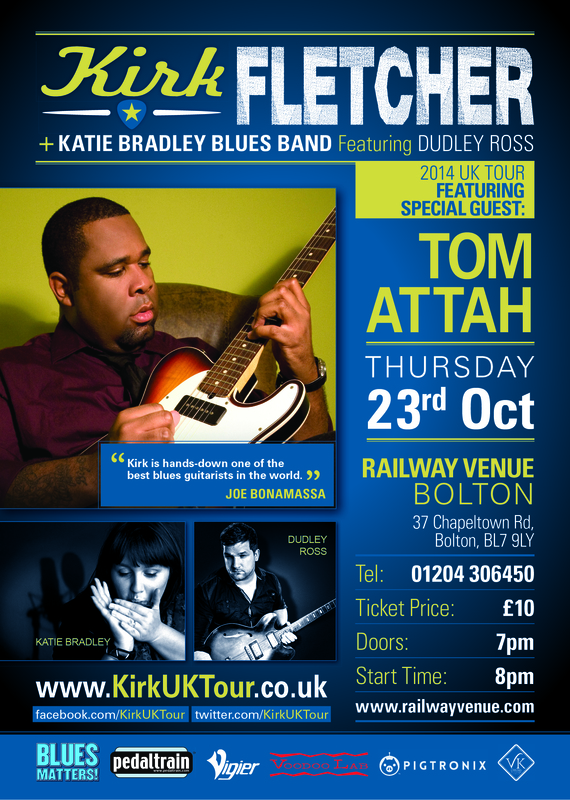 Tom is a strong and soulful performer of new, original acoustic blues. 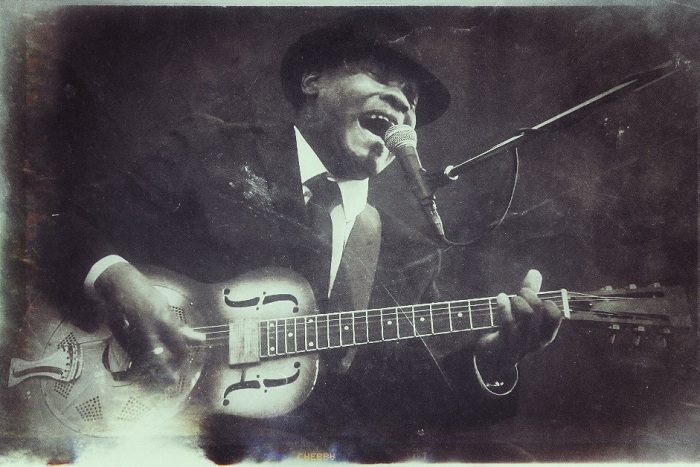 He combines the raw power of Son House with the dense hypnotic rhythms of Howlin’ Wolf and the barrel-chested roar of the old blues belters; taking audiences on a journey from the Delta to the Download. 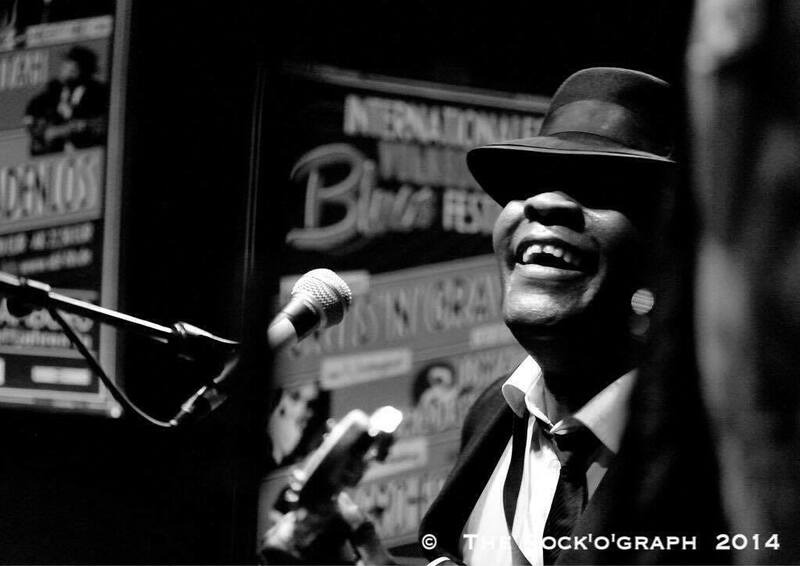 What can you tell us about your role in this year’s Great British Rhythm and Blues Festival? I’m doing two things. Firstly, I am hosting the new acoustic stage at The Little Theatre. The acoustic stage is traditionally one of the best daytime stages in the festival, so I am very excited about the way that we are developing it in a new venue and with a new spin on the performers we are presenting. 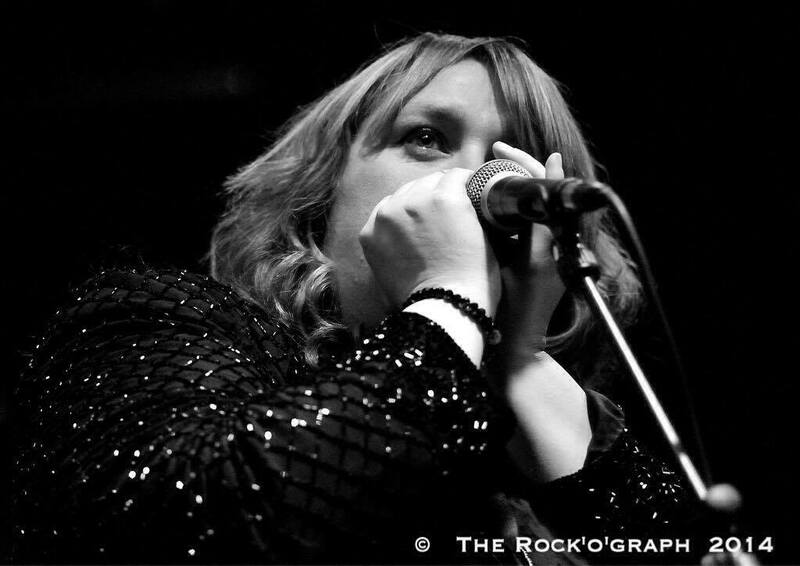 Secondly, I am performing with my electric band at the Hippodrome on Friday night, which is a serious honour. What kind of set can we expect at the Hippodrome? I’m very interested in driving things forward. We’ve been working on new material which comes from the blues, but tries to take it somewhere new for the 21 st century. 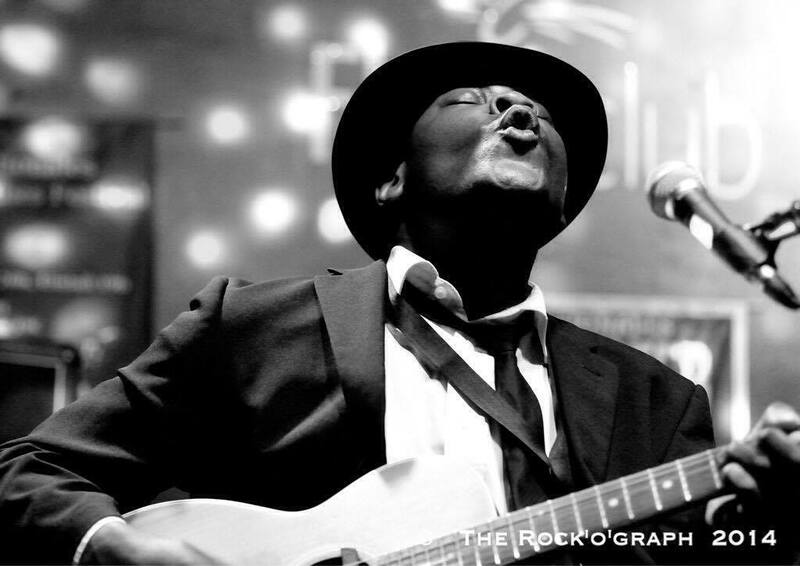 The heartbeat of blues music and blues culture is development, inclusion and change, and I think our new material reflects that. What helped in your decision process when choosing the artists to perform at your acoustic showcase at the Little Theatre? I looked for anyone who was pushing the envelope with blues. There are some frankly astonishing performers who have breathed life into the music at the festival over the last 20 or so years, and so this year I wanted to present new artists who added to that tradition. 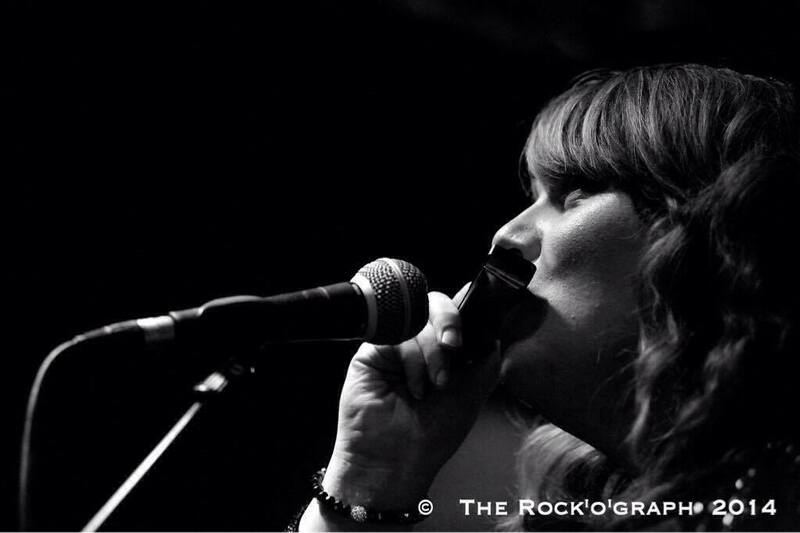 So, whilst there are some familiar faces like Lucy Zirins, TJ Norton and Dave Arcari, there are also some artists who are getting their Colne debut – The Delta Ladies, Jack Blackman… and several others. 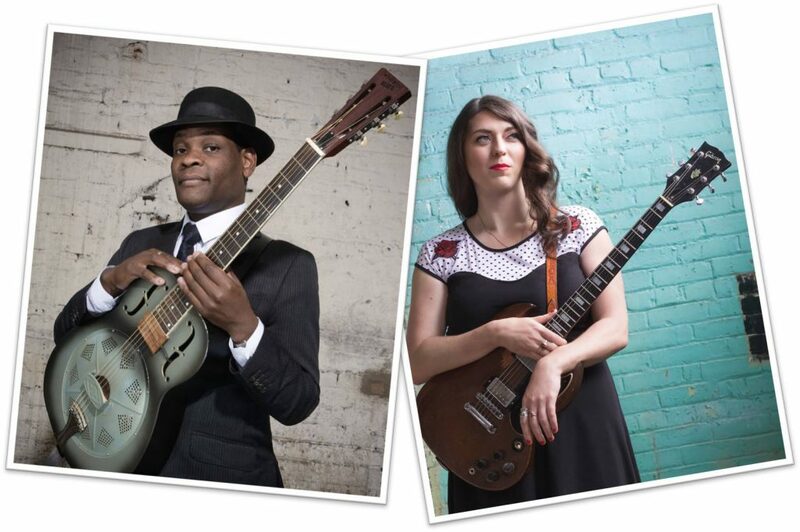 The thing that they all have in common is that they each bring their own unique take to the blues – interpreting it, working firmly within the tradition – but evolving. I started out as a drummer! I was very lucky that where I used to live in Surrey, it was full of the old players from the 1960s – they call it the Rockbroker Belt. I loved drums but one day I wanted to write a song, and so had to learn to play guitar in order to make that happen… and I’m still learning! That’s a simple question with a complicated answer. Frankly, anyone that makes me feel something is someone I look up to, because they’re doing what I think music should do – reaching out and communicating. 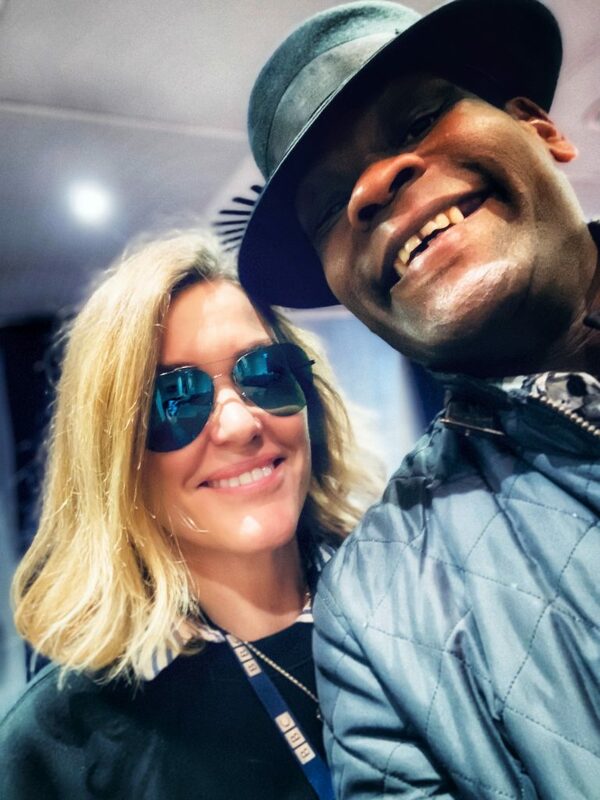 So clearly the greatest artists do that consistently – I still adore the music of Muddy Waters and Son House, but Susan Tedeschi does it, Rag & Bone Man does it, Katie Bradley, Kyla Brox… so many people do it so often and so well. That’s like asking about favourite children, isn’t it? They all mean things for different reasons. 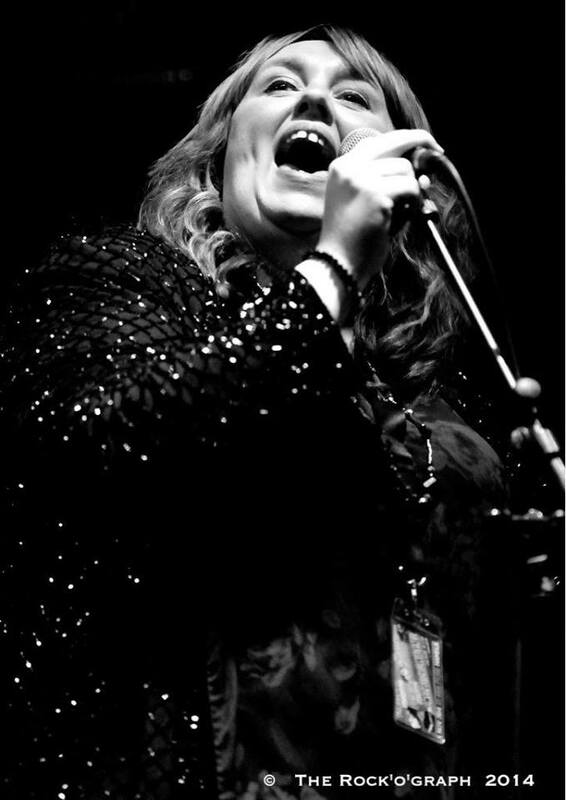 I always open with ‘How Long Has It Been,’ because that was a song that guided me through a difficult time of change in my life. Some of them I have sung as my friends were laid to rest, so that’s a way of bringing the joy of knowing them into a show. Without wanting to dodge the question they all mean that I get to connect with an audience, just in different ways, and so I am grateful to all of the songs for that. What kind of music were you brought up listening to? There was Boney M, Billy Idol, Bob Marley and Stax playing in our house! There was a certain amount of reggae going on, but as soon as I could choose I gravitated towards the blues and to soul. It was Eric Clapton, the Doors, The Beatles, The Stranglers and the Stones that led me back to the blues; I go back and forth into the past and future from there. 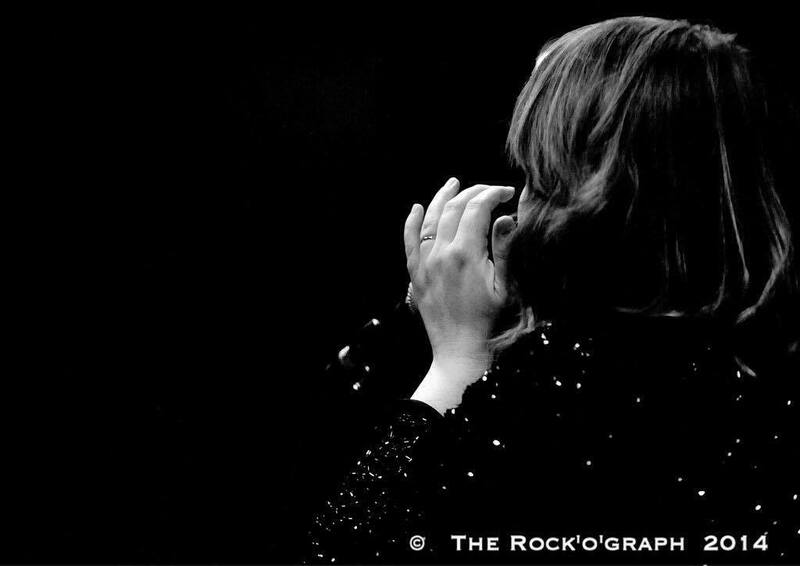 What’s been the most memorable time of your musical career? The most memorable time is now. I’m astonished at the last 10 years, I really am. I’ve been able to travel around the world and meet some incredible people and musicians. It makes me a bit dizzy to think of all the playing, singing and just the talented and generous people I have met – musicians, organisers, audiences – just terrific. It’s like someone threw a switch in the middle of 2007 and everything just snapped into action, it’s amazing! I get to play music I love with my best friends, to audiences who want to hear it, in places that I love to be. What could be better than that? 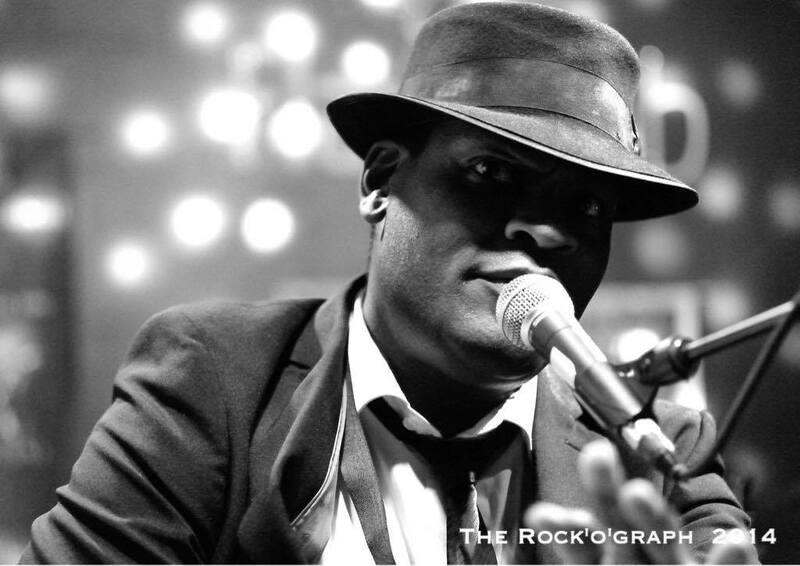 Tom Attah and The Bad Man Clan play The Hippodrome, Colne on Friday 25th August on the same bill as Lachy Doley (Australia) and Ian Siegal (Netherlands). A few weeks ago, I was very excited and honoured to be invited to play guitar at the London flat at 23, Brook Street shared by Jimi Hendrix and Kathy Etchingham between 1968 and 1969. There is a truly wonderful project in planning that may tell the intimate, acoustic story of one of the most creative musicians of the 20th century. The flat is very small and cosy – you have to believe that playing music and talking in that space would be quite magical for any musician and of course, playing guitar there was something of a dream come true. You can read more about it here: https://hendrixathome.wordpress.com/2016/02/01/post-114-soundscapes/. For Jimi, Brook Street was the doorstep to the London music scene of the late 60s. His flat was a short stroll from legendary venues like the Marquee, the Speakeasy and The Scotch of St James and he would spend many evenings wandering from club to club looking for a chance to play. On 14 September 1997, 23 Brook Street was chosen for an English Heritage Blue Plaque commemorating his life and work. 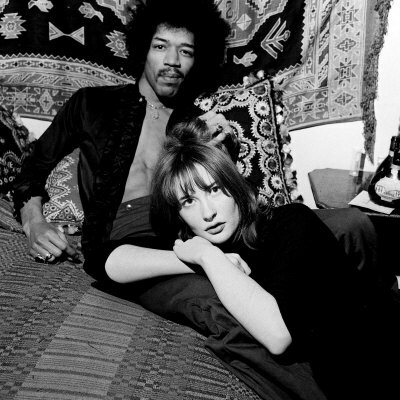 It is the only officially recognised Hendrix residence in the world. Did you know that GF Handel rented the flat next door at 25 Brook Street during the 18th century? The buildings are sites of real musicological interest and there is definitely something about the rooms lived in by these master musicians. You can learn more about the project on the Capital Project link, and follow developments on the Hendrix at Home Blog written by Sarah Bardwell. I played the Volksdorfer Blues Festival in Hamburg, Germany with my very wonderful and talented friend, Katie Bradley this weekend. The evening was incredibly positive, with the venue staff, crew, audience and other bands in a good mood. Special thanks to Stephan Ebel and Meike for their warm hospitality, as well as to Achim at the Dorfskrug and Jorgen and Buchholz for a simply terrific three days – we didn’t want to come home! I am pleased and proud to announce that I will be supporting blues giant KIRK FLETCHER on the October 23rd date of his UK tour. 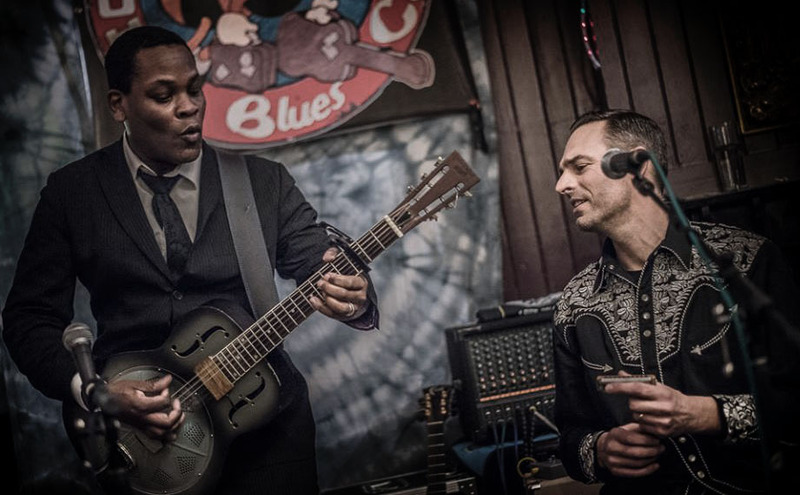 Widely considered one of the best blues guitarists in the world, Kirk Fletcher has commanded the respect and acclaim of critics, peers and fans across the globe. 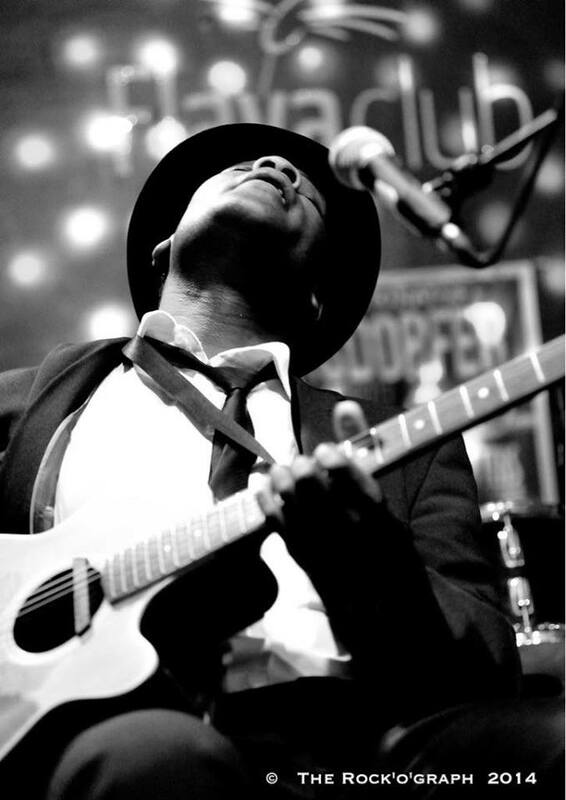 He is a four-time Blues Music Award nominee and has played with a variety of popular artists, including a four-year role as lead guitarist of The Fabulous Thunderbirds. He is also the frontman of his own band, having released three studio albums. A live album and a fourth studio album are currently in the works. 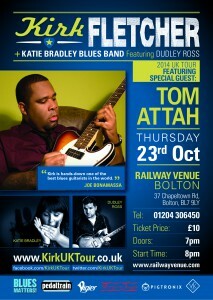 Joining Kirk on his UK tour will be other, contemporary blues heavyweights including Katie Bradley, Dudley Ross, Vince Lee, TJ Norton and many, many others. 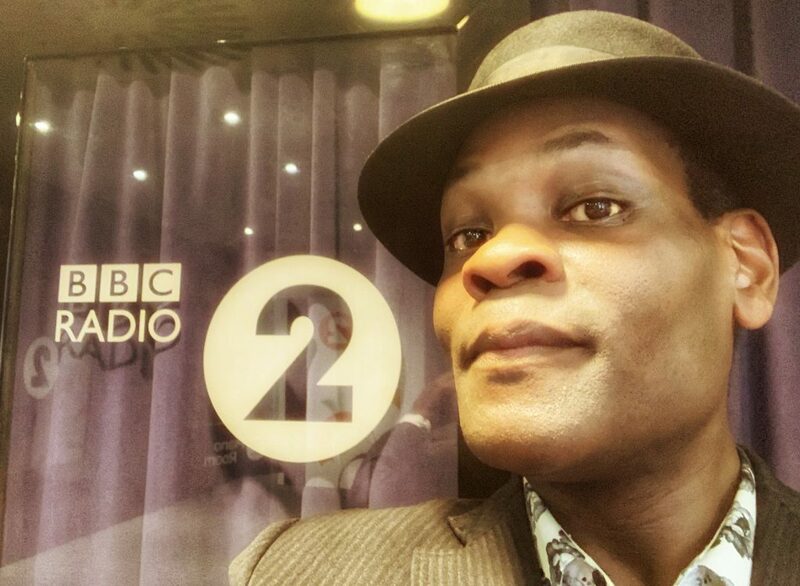 Kirk will also be appearing on the Paul Jones Rhythm & Blues show and performing a session live from BBC Maida Vale. For more information, tickets and to get involved, please check out the tour’s Facebook page: https://www.facebook.com/kirkuktour.